We, TU Munich’s 2012 iGEM team, strive to catalyze the diffusion process of knowledge about genetic engineering and synthetic biology among the general public. Using the example of iGEM’s first and finest SynBio Beer we involve, interest and inspire people to reconsider preconceived ideas and encourage them to openly engage in a broad discussion weighing pros and cons of genetic engineering in foodstuff. We sketch a future where new technology can be applied in a meaningful way to complement traditional foods or beverages. Limonene is a cyclic terpene and a major constituent of several citrus oils. D-limonene has been used as a component of flavorings and fragrances. It is formed from geranyl pyrophosphate by limonene synthase. We successfully demonstrated the production of the flavoring substance limonene by expressing limonene synthase in S. cerevisiae, which naturally synthesizes the educt geranyl pyrophosphate. (+)-limonene synthase 1 (BBa_K801065) and (+)-limonene synthase 1 with yeast consensus sequence (BBa_K801060) were successfully cloned into our new yeast expression vector pTUM104. Expression of recombinant limonene synthase in Saccharomyces cerevisiae was proven by western blotting. Subsequently the protein was purified using SA-chromatography and size exclusion chromatography. The functionality of the enzyme was verified by in vivo and in vitro detection of limonene via GC-MS. Furthermore, we established gene constructs of the limonene synthase coding sequence with different yeast specific promoters and terminators (BBa_K801062, BBa_K801063 and BBa_K801064). Last but not least, we have brewed iGEM's first SynBio beer containing limonene. We have achieved functional expression of Citrus limon limonene synthase and production of limonene in yeast. Furthermore, we have been able to proof the production of limonene in the beers we brewed. Further experiments regarding the concentrations of limonene produced will be carried out in the future. Thaumatin is a natural protein which is synthesized by the katamfe plant (Thaumatococcus daniellii). It is said to be 2,000 to 100,000 times sweeter than sucrose on molar basis, but the sweetness builds up slow and lasts long. It has been approved as a sweetener by the European Union (E957). Our aim is to have S. cerevisiae secrete functional thaumatin by expressing preprothaumatin – a principle which has been proven by [Edens et al., 1984]. The BioBrick for preprothaumatin BBa_K801080 as well as an expression cassette K801080 were successfully cloned, expressed in yeast, purified using an ion exchange chromatography (see figure C) and detected in the SDS-PAGE. Therefore, the expression of thaumatin in yeast could be demonstrated and functionality of the BioBrick is confirmed. A proof of principle for the expression of thaumatin was achieved. Further goals are the increase of the expression of thaumatin and the investigation of the secretion. Caffeine is a purine-alkaloid and its biosynthesis is known from coffee and tea plants. The molecule acts as a competitive antagonist of adenosine receptors and, therefore, increases indirectly neurotransmitter concentrations resulting in warding off drowsiness and restoring alertness. The idea is to perform a heterologous gene expression of the three enzymes 7-methylxanthosine synthase (CaXMT1), N-methyl nucleosidase (CaMXMT1) and caffeine synthase (CaDXMT1) required for caffeine biosynthesis in Saccharomyces cerevisiae. Successful cloning of the three enzymes 7-methylxanthosine synthase (CaXMT1), theobromine synthase (CaMXMT1) and the caffeine synthase (CaDXMT1) into the shuttle vector pTUM104 and pSB1C3 each. Successful assembly of the BioBricks to form expression cassettes consisting of promoter, gene and terminator: pTEF2-CaXMT1-tADH1, pTEF1-CaMXMT1-tADH1 and pTEF2-CaDXMT1-tADH1) into pSB1C3. Successful assembly of the expression cassettes of the three relevant enzymes forming a composite part of 6.4 kb capable of caffeine production in yeast (Caffeine Synthesis Pathway) into pSB1C3. Successful expression of CaXMT1, CaMXMT1 and CaDXMT1 in Saccharomyces cerevisiae INVSc1 in selective Sc minimal induction medium lacking uracil with 2 % galactose. The homologue expression of the three required enzymes for caffeine synthesis in Saccharomyces cerevisiae INVSc1 transformed with pTUM102_CaXMT1, pTUM102_CaMXMT1 and pTUM102_CaDXMT1 was successful. Further testing of caffeine production using crude extracts from lysed yeast cells which had previously been transformed with our caffeine synthesis expression cartridge has been done and we were successful in producing theobromine, the immediate precursor of caffein, which we detected by the use of LC/MS with multiple reaction monitoring (MRM). Xanthohumol is known as a putative cancer chemopreventive agent due to its antioxidant activities [Miranda et al., 2000]. Our goal is a heterologous gene expression of all enzymes required for xanthohumol biosynthesis in S. cerevisiae. The pathway for the production of this plant secondary metabolite is composed of five steps, starting with the conversion of tyrosine and followed by four further enzymatic reactions. The whole biosynthetic pathway for the production of xanthohumol was converted into BioBricks. Except for APT each of the enzymes were cloned in two versions one having the proposed consensus sequence for more efficient expression in yeast chassis and another for usage of these BioBricks in other chassis. All BioBricks were sequenced. Sequences can be found in the registry of standard biological parts: PAL (BBa_K801090, BBa_K801091), 4CL (BBa_K801092, BBa_K801093), CHS (BBa_K801094, BBa_K801095), APT (BBa_K801096 and OMT (BBa_K801097, BBa_K801098). The construction of the xanthohumol pathway was achieved, whereas the expression and characterization might be an interesting task for iGEM teams in the future. Designing an expression vector for yeast which is compatible to the iGEM cloning principles and standards was the main aim of this subproject. Based on the commercially available pYES2 vector we created vectors containing inducible and constitutive promoters in order to establish efficient possibilities to clone and express our enzymes. Explanations on the figure: Figure A shows the new multiple cloning site (MCS) containing the RFC 10/25 restriction sides and the DNA sequence coding for the Strep-tag II. Figure B gives an overview of all important functional elements located on the vector backbone. Upstream to the new MCS lies a T7 promoter primer binding site allowing easy forward sequencing of integrated gene constructs using the standard T7 primer. The URA 3 gene is a prototrophy marker used for the selection of transfected cells. Figure C to E present the successfully designed BioBricks: pTUM100 simply contains the new MCS, the transcription terminator and further elements required for cloning and transfection. pTUM102 to pTUM104 contain in addition the constitutive promoters pTef1, pTef2 and ADH. On pTUM104 the galactose inducible promoter pGAL1 is located. Using the pYES vector from Invitrogen we first deleted five forbidden restriction sites in the vector backbone via side directed mutagenesis. Furthermore, the original multiple cloning site was replaced by a multiple cloning site compatible with the RFC 10/25 cloning standards. To allow easy extraction and purification of proteins for in vitro applications the new multiple cloning site allows to express proteins with a Strep-tag II. Exclusion of the galactose inducible promoter provided a powerful basis vector for the integration of user-defined promoters. This way the pTUM100 vector gives a valuable contribution to our and to further protein expression and promoter characterization experiments in Saccharomyces cerevisiae. Moreover, we used the pTUM100 to integrate the three constitutive promoters Tef1, Tef2 and ADH which come all with different promoter intensities. The galactose inducible expression system was a great aid for the majority of all subprojects. Especially the opportunity to purify and detect (via Western blot) proteins using the Strep-tag II did facilitate our laboratory practice and accelerated our work progress. To cover even more demands we are planning to design a second vector template containing a His-tag. pTUM100 (BBa_K801000), pTUM101 (BBa_K801001), pTUM102 (BBa_K801002), pTUM103 (BBa_K801003) and pTUM104 (BBa_K801004). By developing inducible promoters and placing them upstream of our biosynthetic pathways we create the possibility to make S. cerevisiae dynamically respond to concentration changes in its medium as well as to external stimuli. An optimal inducing substance needs to be inexpensive, nontoxic and fully controllable in its application. Only substances with these characteristics allow to precisely regulate a system temporally, spatially and quantitatively. The KlADH4-promoter from the yeast Kluyveromyces lactis regulates the expression of a mitochondrial alcohol dehydrogenase in an ethanol-dependent way. An alcohol-inducible promoter would be incredibly useful for anyone planning to brew a beer with a transgenic yeast - it would allow for the induction of the target genes after the main fermentation has finished and this way, the metabolic burden for the yeast cells could be lowered. All the transcription factors known to be involved in the regulation of the KlADH4-promoter in K. lactis also occur in S. cerevisiae [Mazzoni et al., 2000]. This is why we are confident that this promoter maintains its unique characteristics when transformed into S. cerevisiae. A: The KlADH4-promoter was cloned from genomic DNA of Kluyveromyces lactis. The new BioBrick BBa_K801020 was inserted into our pTUM100 vector. eGFP served as a reporter gene for characterization in S. cerevisiae (plasmid name: pTUM100_KLADH4_eGFP). B Emission spectra of eGFP obtained during cultivation of S. cerevisiae transformed with pTUM100_KLADH4_eGFP using different carbon sources. Blue: Galactose was used as carbon source. The measured ethanol concentration was 1.7 % (v/v). The peak at 509 nm indicates that eGFP is expressed. Red: Glycerol was used as carbon source. The measured ethanol concentration was 0.2 % (v/v). No eGFP fluorescence could be detected. At this time our results concerning the KlADH4-promoter (originally from the yeast Kluyveromyces lactis) suggest that this promoter is ethanol inducible in S. cerevisiae. Further experiments are still being done to abolish residual ambiguities. The lowest ethanol concentration at which eGFP-expression was detected is 0.9 Vol.-%. Because S. cerevisiae is such a good brewer, it was difficult to produce a stringent negative control in our characterization experiments. However, we finally figured out some experiments that allowed us to keep the ethanol concentration below 0.5 % v/v, which is a concentration at which induction is observed in K. lactis. We are working hard on providing additional data, but we are confident that we will be able to provide clear evidence that this promoter is ethanol-inducible not only in K. lactis, but also in S. cerevisiae. The idea behind a light-switchable system (LSPS) is to create a gene expression system which can be induced and deactivated by light of a certain wavelength. This system is extremely attractive, as induction does not require the addition of a specific substance. This makes induction cheap, fast, precise and also compatible with the Bavarian purity law. Principle of light-dependent switching of gene-expression. Data for the GAL4 based light-switchable promoter system. All fusion proteins for the two types of a light-switchable promoter system has been finished (BBa_K801039, BBa_K801040 and BBa_K801041), also pTEF1 driven gene expression batteries coding for all components of each type of our light-switchable promoter system has been done (BBa_K801042 and BBa_K801043). GAL4 based light-switchable promoter system is working fine! LexA based light-switchable promoter system even works more efficient but reporter construct (BBa_K165031, iGEM08_BrownTwo) is extremly leaky due to suboptimal LexA binding elements, which contains the TATATAA sequence of the typical yeast TATA-Box. The solution to prevent high basal gene expression is to create a minimal promoter preceded by DNA motifs which are recognized by LexA but do not contain the TATA sequence (e. g.: BBa_K079039 or BBa_K079040). A general improvement to lower the basal activity and to get an higher S/N-ratio in both systems is to use low-copy yeast plasmids instead of high-copy plasmids. GAL4 based light-switchable promoter is working! LexA based light-swichable promoter is also working but reporter system has to be improved. So the logical next step would be to design of a minimal promoter preceded by DNA motifs which is recognized by LexA but not by TATA binding proteins of the yeast transcription machinery (e. g.: BBa_K079039 or BBa_K079040). A general improvement to lower the basal activity and to get an higher S/N-ratio in both systems is to use low-copy yeast plasmids instead of high-copy plasmids. Working with food, it is unacceptable to use antibiotics to keep up the selective pressure during the brewing process. Since we cannot work with auxotrophies in beer either, we have to make sure the yeast cells do not lose the plasmids harboring our BioBricks. The most promising way to accomplish a long lasting presence of our constructs is to achieve genome integration. First experiments to characterize the function of the yeast integration system were performed and the used selection marker was maintained in the yeast culture, although the selection pressure was switched off. This indicates that first integrations were achieved. Maintaining the plasmids harboring our expression cassettes in the yeast cells during the brewing process is best possible using genome integration. This becomes increasingly interesting, when a yeast strain with different expression cassettes is to be created. Because this is intended for the next step of our project the integration of our expression cassettes becomes increasingly important. Contrary to popular opinion the chief ingredient of beer is not YPD but gyle, a carefully prepared mixture of malt, hop and water. Although the name of the yeast strain commonly used in the lab, S. cerevisiae, suggests that it is used in the beer brewing process. The yeast strains generally employed in brewing have strongly adapted to gyle, as they are reutilized in every succeeding brewing cycle. Hence some investigation on how our yeast performs in gyle and experiments on the toxicity of the substances produced by our biosynthetic pathways were necessary. Our experiments on the different yeast strains show that the growth of several different yeast strains is not impaired in gyle! The toxicity test with the substances caffeine and limonene showed a toxicity for yeast cells at higher concentrations in the cultur media. Expression assays proved the necessity of genome integration for a proper SynBio Beer. At the day of the final Wiki-Freeze we could finish the brewing with three different ingredients (limonene, thaumatin and caffeine) whose biosynthesis we have engineered during this summer. This was done using yeast culture expressing BioBricks from a plasmid as well as using cultures in which the expression cassette was integrated into the genome. 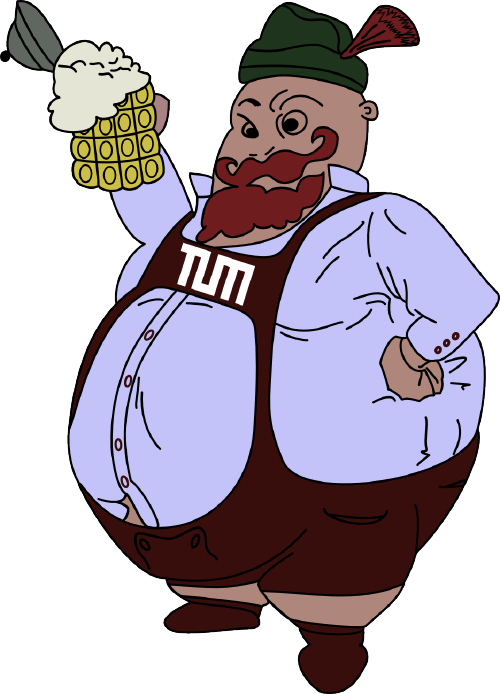 This gives us the great honor to present iGEM's first and finest SynBio Beer: TUM-Brew. [Edens et al., 1984] Edens, L., Bom, I., Ledeboer, A. M., Maat, J., Toonen, M. Y., Visser, C., and Verrips, C. T. (1984). Synthesis and processing of the plant protein thaumatin in yeast. Cell, 37(2):629–33. [Miranda et al., 2000] Miranda, C. L., Stevens, J. F., Ivanov, V., McCall, M., Frei, B., Deinzer, M. L., and Buhler, D. R. (2000). Antioxidant and prooxidant actions of prenylated and nonprenylated chalcones and flavanones in vitro. J Agric Food Chem, 48(9):3876–84. [Mazzoni et al., 2000] Mazzoni, C., Santori, F., Saliola, M., and Falcone, C. (2000). Molecular analysis of uas(e), a cis element containing stress response elements responsible for ethanol induction of the kladh4 gene of kluyveromyces lactis. Res Microbiol, 151(1):19–28.